Should I bring my dog for a one night trial run to see if they like it? We have found that this is not helpful for your dog. In general, dogs have hard time with change so a one night trial is too short of a time for your pup to adjust. If you feel the need for a “trial run” then a weekend is best. It gives your dog a chance to adjust to our schedule, get to know the staff and make a few new dog friends! However, we find most dogs are fine without this extra effort. Do you need to meet my dog beforehand? No, you certainly can schedule a visit, but it is not necessary. Our staff is skilled at handling many different kinds of dogs so all are welcome. Neither is it necessary for training dogs, Nancy is willing to work with all types of dogs and problems. Will my dog feel abandoned, miss me or be mad at me? No, your pet will have a great time at “camp”. Your dog may be a bit confused when you walk out the door without them, but similar to a toddler they quickly refocus on us. Dogs have a very weak sense of time so they are not aware of how long they are here. Your pet will have plenty of exercise and personal attention while they are here and our routine gives them a sense of comfort. Dogs are great at living in the moment and we make sure all their needs are met during their visit. They will be happy to see you when you return just as when you come home from work. Will my dog remember me? Absolutely, yes! Dogs have a fabulous memory for impression and you have made a wonderful impression on your dog. They will know you instantly and greet you enthusiastically. What is a typical day like for my dog? The staff arrives early in the morning and lets everybody out, feeds breakfast and does morning medications. Later in the morning everyone get s playtime. Early afternoon is nap time. Staff arrives again around 3 in the afternoon and begins with play groups. Evening meals and medications are then completed. We are fortunate to have staff come in late (around nine at night) to let all the dogs one more time before bed. The late night staff checks on everybody, fills waters, fluffs blankets and makes sure all the dogs are set for a quiet nights rest. If your dog is here for training, lessons are integrated into their day around the general schedule. You can bring a bed, blanket or your pup’s favorite toys. You should bring any medications that your dog needs; please clearly label them. You can also bring medications that your dog takes on an as needed basis, for example meds for lameness, thunderstorm anxiety or ear infections that may flare up. Please bring a copy of your dog’s vaccination history, emergency contact information and any special diet requirements. You may leave your bowls at home, we use our own. Conveniently, Nancy’s husband is a veterinarian and is available for both emergencies and routine care. We own Northwood Veterinary Hospital and is located just a few miles away; there are also three 24 hour emergency hospitals within 30 minutes. Can I get my dog groomed? Yes, we have an excellent local groomer that can care for your pet. All dogs that are here for more than 2 or 3 days are bathed before they go home and nails are trimmed, but if you would like a full grooming we can arrange it for you. Yes, your pets comfort is our first priority. We have radiant heat in our floors to keep the floors warm in the colder weather. 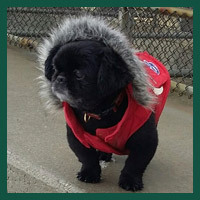 There is also radiant heat in the outside runs so that your pet will not slip or injure themselves on the ice. We have large ceiling fans in each kennel room to circulate heat and cool air. We also have some areas that are air conditioned for older dogs or breeds that may have a hard time in the heat. We average 15-18 dogs here at any given time. We have 27 runs and during peak seasons we may be full, but we also have more staff so that our guests receive the same personalized attention. What happens to the dogs when you are closed or on holidays? The dog’s days are all pretty much the same…..weekends, weekdays and holidays. Our staff is here 7 days a week to care for your pet. We are simply closed for appointments on certain days, Wednesdays, Thanksgiving and Christmas. We are open all other holidays. How do you decide which dogs play together? All dogs are evaluated in regard to age, athletic ability, personality, size etc. and then we form small play groups. 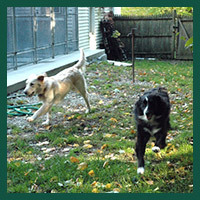 We only allow 2, 3 or maybe 4 dogs to play at a time; this allows for maximum supervision and safety. If my dog doesn’t like other dogs do they still get play time? Yes, they get the same amount of outside time to play in our big yards. They are allowed to explore on their own or play with one of our staff. Where do you exercise the dogs? We have approximately an acre of land divided into several fenced play yards. This space allows your dog to play in the woods and open spaces and gives us ample opportunity to exercise each dog for the length of time they require. For training dogs, we can simulate realistic situations to practice coming when called. Do I need to bring my dog’s crate? No, most dogs enjoy the comfort of our large runs. However, if your dog needs to be crated for medical reasons, or if they are a puppy and are still getting their schedule straight…..we have plenty of crates available. If you feel your dog needs their own crate, you are welcome to bring it. How do I bring my pet’s food? You can bring the food in whatever container is most convenient for you. You can individually bag meals, bring it in its original bag or some kind of large tupperware is fine, too. We request that all dogs be current on their rabies, distemper-parvo combinations and bordatella vaccinations. We will accept your veterinarian’s recommendations for frequency and titers for proof of immunity are acceptable. We also recommend that you have your dog checked yearly for heartworm and intestinal parasites. Yes, our staff is trained to administer injections. We can accommodate most medical special requests. We are willing to follow any diet requests that you may have. We have a refrigerator and a freezer available. You are welcome to bring your own food of any kind or we carry 13 different kinds of dog food on site. We usually have the adult diets, so if your dog is on puppy or weight control, we ask that you bring it with you. Dogs may be fed once, twice or three times daily. Will you give my dog their heartworm or flea & tick medicine? Yes, just bring the medication with you and we will give it on the requested day. Unfortunately, we have found that visits are counterproductive for your dog. It is difficult for them to see you and not go home with you. So, we ask that you trust us and wait until the end of training to see your pet. You can call anytime and we will update you on our progress. Do I bring the entire family to the training lesson? Definitely the adults in the house should attend, if at all possible. Children are welcome to attend, but the lesson is several hours long and the first hour is without your dog. So, it is important that they are old enough to be patient and participate in the lesson. What if I need help with my dog after it returns from training? Just call or email us and we will help you out! Follow up is provided at no charge and can come in the form of phone calls, a lesson at your house or at the kennel, or some tune up time with Nancy. Is Nancy the only trainer? Nancy is the primary trainer and responsible for the design and direction of each dogs program. 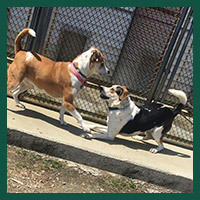 Julie, a long time employee, will assist with training – giving the dogs exposure to different trainers helps them generalize and be ready for their transition back to their family. Both Julie and Nancy use the same style of training and coordinate all lessons. Your pet will benefit from close to 30 years of training experience. Don’t I have to be the one to train my dog? No, you have to reinforce training and form a positive working relationship with your dog. Your dog can learn from a qualified trainer and then transfer to you. Remember, some o f the most highly trained dogs in the world — guide dogs for the blind, assistance dogs and law enforcement dogs – are trained by professionals and transferred to handlers. With the proper instruction, transition to you is easy. What kind of problems do you deal with in training? Frankly, everything! 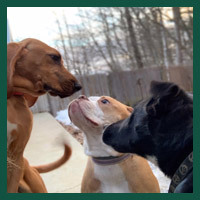 We can take anything from young puppies for general manners to adult dogs with severe behavior problems; jumping on company, off leash work, aggression, house training and anxiety problems are all concerns that we deal with on a regular basis. May I visit your facility? Of course, we ask that you make an appointment so that we can spend enough time with you to answer all your questions and give you a tour of the kennel. Does someone live on the property? Nancy’s family lives on the property and if they are away there is a qualified house-sitter (usually an employee) staying at the house. The kennel has a security and fire alarm to insure your pet’s safety at all times. We don’t board cats here at Saddleback , but Northwood Veterinary Hospital does and we can even provide transportation for your feline friend from here so you only have one drop location. We ask that you make an appointment for training drop-offs and pick-ups so that Nancy can spend the time she needs with you. Training appointments are scheduled every day and can be any time of day or evening. The kennel is open for boarding appointments from 9-11 and 4-6 everyday. Why do I frequently get the answering machine when I call? We are a small facility and our staff’s primary focus is caring for the dogs. Our office manager, Heather, and the owner, Nancy, are primarily responsible for the phones. 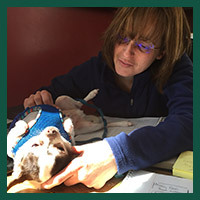 Nancy is frequently engaged with training dogs or clients and Heather works part time. So, please be patient and we will call you back as quickly as we can. If your call requires immediate attention, please leave that on the machine as the staff does check messages frequently. Just remember that when your dog is here they will receive the same attention from the staff! Why are you closed in the middle of the day? Most people worry that their dog will be bored at a kennel. Actually, they are more likely to be over stimulated; there so many new sounds and smells and things to do! So, we have instituted nap time from about noon to three so that your pet can rest and be ready for afternoon play time. Do you have any other services? 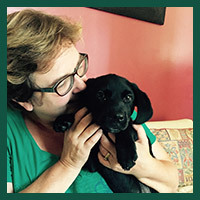 Yes, Nancy can provide guidance & consultation for finding, choosing or evaluating a new dog. She is available for public speaking engagements or seminars for groups, veterinary hospitals, or other organizations. Nancy also works with the legal community serving as an expert witness and providing evaluation for legal situations. At this time, we welcome your personal check or cash; debit or credit cards are not accepted. Does your price vary by the size of the dog? No, we charge for the quality care we give each dog and that does not vary by size. Do you charge extra for exercise, special diets or requests, medications, etc? We charge one flat rate and give each dog what they need. Exercise, special food, medications, etc .are all included. We do not do a la carte menus; each dog is an individual and receives the services they require to have a great visit. The only extra fee is if you ask for training services. Call us today at 603-942-5988 or email us through our contact form.